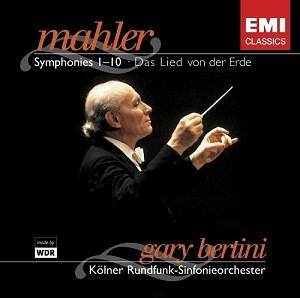 It seems that Gary Bertini, like Gustav Mahler, is destined to be better remembered after his death than he was known during his life. When he passed away in 2005, he was little known outside Israel, Japan and continental Europe and nowhere near as widely recognised as the glamour conductors who appear on the �major� labels. His recordings were few and hard to find. A year after his passing, Capriccio has launched a Gary Bertini Edition (see, for example, review) featuring live recordings drawn from the archives of the K�lner Rundfunk-Sinfonie-Orchester, and EMI has re-released his Mahler cycle. These recordings have languished in the back catalogue for far too long. Bertini began recording his cycle for Deutsche Harmonia Mundi in 1984. When EMI bought the smaller label - now a Sony/BMG imprint - the project was in full swing and EMI kept the cycle going to its conclusion. The problem was that at the same time EMI was in the midst of recording Tennstedt�s Mahler cycle with the London Philharmonic Orchestra. Tennstedt was hugely popular with British audiences and that fact, combined with his more immediately emotional and personal approach to Mahler, probably made his cycle seem the safer bet. Bertini�s recordings were allowed to fade into the deletions lists. Despite a partial revival by EMI France, they were largely forgotten. As I mentioned in my earlier Bertini review, I stumbled across a copy of the long-deleted Mahler 4 from this cycle in the City of Sydney public library a couple of years ago, and was impressed by Bertini�s mastery of long singing lines and fine orchestral balances. Happily, those qualities that made his Mahler 4 special are present in every one of these recordings, making for a remarkably consistent cycle. There are almost as many interpretative approaches to Mahler�s symphonies as there are conductors who tackle them. For conductors like Solti, they are virtuoso concertos for orchestra. For those like Bernstein and Tennstedt, Mahler�s symphonies are a life and death struggle. For the likes of Boulez, they are simply great works of art. For others, like Kubelik and Chailly, Mahler�s symphonies are great works of art depicting life and death struggle. Bertini belongs to this last group of conductors. That is not to say that his Mahler sounds just like Kubelik�s or Chailly�s any more than Bernstein�s interpretations could be mistaken for Tennstedt�s, but his general approach to the scores is similar. There are, of course, some distinguishing features. Bertini excels in the big elegiac slow movements, and has a rare ability to maintain the tension of the music at a slower pace. In his hands, the final movement of the Third Symphony is long-breathed but rapt. He takes a full 6 minutes more in this than his EMI stable-mate Klaus Tennstedt - whose recording of this piece, and this movement in particular, has always been a favourite of mine - and three more minutes than Chailly on Decca. Similarly, the last movement of the Ninth is, at a touch under half an hour (28:34 to be precise), similarly expansive and even more affecting. This is not to say that Bertini always favours slow tempi. His reading of the gentle third movement of the fourth symphony is closer to the average, and his flowing reading of the fifth's famous adagietto clocks in at 10:05 � not quick, but not slow either. The other thing that distinguishes Bertini�s Mahler is his ability to bring out individual details but place them within the context of his overall conception of each symphony. There are a number of conductors who are adept at bringing out the details in these scores, but at the risk of losing sight of where these details fit into the symphony. Rattle is one example. Compare the two conductors� approaches to the cowbell interludes in the first movement of the Sixth Symphony, and you will see what I mean. Bertini�s slight emotional detachment from the scores - looking at Picasso�s Guernica rather than living it - gives him the ability to see how the details fit as part of the whole. He is also helped by stunning recorded sound. The German radio engineers do amazing things with these recordings, capturing a bright acoustic consistent across the various recording venues and bringing out detail without spotlighting. In which other recording of the Seventh does the mandolin of the fourth movement emerge so naturally from within the orchestra? Applause has been edited out of the live recordings captured here, and such is Bertini�s success in giving these symphonies vibrant performances that you may find yourself tested to pick the live recordings from the studio ones if listening blind. Bertini is fortunate to have a fine orchestra at his command. As much as I love Tennstedt�s readings and as much as I admire the enthusiasm with which the LPO responds to their beloved chief, the K�lner Rundfunk-Sinfonieorchester roundly outplays them, particularly in the brass. The strings have more shine than warmth, but they have adequate weight where required. They are a match for Solti�s Chicago and tidier than Bernstein�s New Yorkers. The performances themselves are generally excellent and some are fantastic. The First Symphony is fresh and invigorating, similar in approach to Chailly�s. The wry klezmer episodes in the third movement are superbly characterised. Chailly has the edge in the Fourth Symphony, with Barbara Bonney in fresher voice than Bertini�s Lucia Popp. Bertini also misses some of the grim irony of death�s fiddler in the second movement, which Kubelik captures so well, but the arc of his performance is very satisfying overall. The Second does not fare quite as well, with Bertini's cool approach taking the edge off this most magnetic of symphonies and the clean and clear playing of the orchestra, while revealing a lot of ear-catching detail, sounding perfunctory in places. The Third, by contrast, gets a monumental performance that softens and mellows as it goes. Bertini's headlong approach in the Fifth Symphony is very exciting. I prefer the firmer hand and more measured tempo in from figure 7 in the score, adopted by Boulez on Deutsche Grammophon and Barshai on Brilliant Classics, but Bertini's approach is consistent with Mahler's tempo marking �Pl�zlich schneller. Leidenshaftlich. Wild� (Suddenly faster. Passionately. Wild.). In the Sixth, Bertini again reminds me of Chailly, and the honours are evenly split. I think the Italian handles the transitions better, though Bertini's mastery of the detail is superior. His seventh is distinguished by apt tempi and a perfect balancing of parts, particularly in the first movement and the spooky Nachtmusik movements that flank the central scherzo. This Eighth is wonderfully exciting. The soloists and chorus do not overwhelm the orchestra as they do in Kubelik�s recording on Deutsche Grammophon. Again the comparison with Rattle�s recent Mahler 8 on EMI (see review) is telling. Rattle�s performance, exciting though it is, yields to Bertini�s energy and more powerful conception of the symphony as a whole. The Ninth is a performance of understated feeling, capped by a mesmerising final movement. Like many other Mahler conductors of the his generation, Bertini performed only the adagio of the Tenth Symphony rather than any of the completions of Mahler's unfinished score. While none of them is perfect, I would be loath to be without a recording of at least Cooke's realisation of Mahler's last symphony. Conductors who perform the adagio in isolation run the risk of imbuing it with too much valedictory finality, a little anger notwithstanding, whereas the adagio is in reality only the opening movement of a symphony that rages against the dying of the light. Interpretative critique aside, though, this is as satisfying a stand-alone adagio as you will find. Capping the cycle is a performance of Das Lied von der Erde that is simply stunning. Bertini�s concern for balance of parts, clarity of textures and long lines delivers a delicate performance of this symphony which, though scored for large orchestra, is full of chamber music textures. He points up the Chinoiserie of the central movements and allows Der Abschied to dissolve as it should. Orchestrally speaking, Bertini's approach to the score sits somewhere between Boulez's on Deutsche Grammophon and Salonen's on Sony. Ben Heppner is in fine voice, though he sings without his latter day full Heldentenor heft. His performances are beautifully nuanced and calculated to mesmerise rather than terrify. Maria Lipov�ek sings with real subtlety. Though she does not quite match Christa Ludwig or Janet Baker, her performance - which includes a moving account of Der Abschied - is very satisfying. Texts are printed in full (a plus) but the Kyo Mitsutoshi's affectionate booklet notes focus on Bertini and rather than on Mahler or his symphonies, which will not help beginners (a minus). EMI is clearly targeting collectors with this box set, but beginners will find it a less idiosyncratic guide to Mahler than Tennstedt's cycle, which EMI does market to beginners, complete with helpful analyses of the works. As a complete cycle of Mahler symphonies, Bertini�s box is second to none. More consistent than Tennstedt and Chailly, better sound than Kubelik, less idiosyncratic than Bernstein, more human than Solti, this is the boxed set to buy if a boxed set you seek. All of the performances collected here have something special about them, and a few of the performances (1, 5, 7, 8, 9 and Das Lied) are a match for any other in the catalogue. In short, this cycle is an essential purchase for all Mahlerians and a superb set for beginners. Seek this out in the post-Christmas sales.